An ad agency helps craft breweries rise with the tide. With new breweries popping up across Long Island, craft beer companies in the region are having their moment in the spotlight. “If you include Brooklyn and Queens, there are 50-plus [breweries], while in 1997 there were only three,” said Jim McCune, the executive director of craft beverage marketing at Melville-based EGC Group. Two of McCune’s friends, he said, founded Patchogue-based Blue Point Brewing Company, and he’s helped build the label’s identity as its brand designer. Blue Point has captured the imagination of many a craft-brewery – especially after 2014, when Anheuser-Busch InBev purchased the company for a reported $24 million. And in the last four years the number of craft brewers rose nationwide from 2,200 to 5,600, McCune said. But when it comes to craft breweries, New York has an edge, McCune said. Craft breweries are also good for local tourism, McCune said. He cited “brew cycles” in Riverhead where beer enthusiasts on a 14-person bike ride through town and stop at breweries. There are local brew-and-cheese events, he said, and also “Jack and Jill” tours where the guys visit breweries while the women stop at wineries. Spotting the growth trend, EGC launched its craft beverage marketing division four years ago, bringing McCune onboard, said Nicole Larrauri, the firm’s president. “The thirst for beer is insane,” she said. With Blue Point as the firm’s first client, the customer base has grown to include Glen Cove-based Garvies Point Brewing and Elmsford-based Captain Lawrence Brewing Co. EGC even branched out into supplemental markets, and for example, now counts a hops provider near Seattle, Washington, as a client. “There are so many new [breweries],” Larrauri said, adding that the company offers strategy in addition to branding. Still, “a lot of companies don’t have budgets for big campaigns,” she noted. But clients are building followings with social campaigns, including vibrant Instagram accounts, she said. Through social media, breweries are creating communities at a time when America’s “flavor profile” is changing, McCune said. And many of those craft-beer enthusiasts are millennials who respond to Instagram and Facebook. And when a company gets purchased by a beverage giant, consumers want to know “who’s actually brewing this beer,” McCune said. EGC drinks the talk. 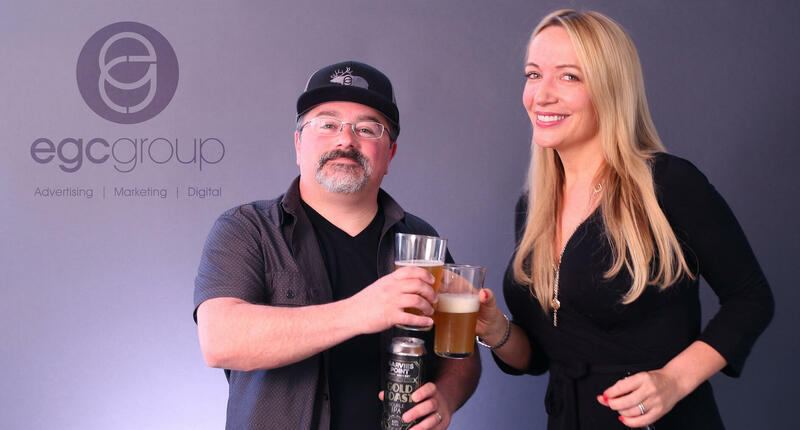 When the agency celebrated its 30th anniversary two years ago, it worked with Riverhead-based Crooked Ladder Brewing Company to create EGC 1985 IPA.